One of the largest oilfield services companies, Weatherford International is headquartered in Switzerland, and currently operates in more than 100 countries across the world, employing more than 52,000 people. The company has regional hubs in major energy-producing regions such as Asia, Canada, Europe, Latin America, the Middle East, Russia, and the United States. Weatherford has a product and service portfolio that spans the life cycle of a well including drilling, evaluation, completion, production and intervention as well as research and development. Weatherford selected digital signage from ONELAN to improve communications across their operations in Abudhabi (U.A.E). Thirty nine ONELAN Net-top-boxes (NTBs) are installed at Weatherford’s premises in Abudhabi, and four further ONELAN NTB subscriber units are installed in other Weatherford office locations across UAE. All the subscriber NTBs rely on the feed from a ONELAN NTB5500P publisher unit installed in Weatherford WTTC, Abudhabi. 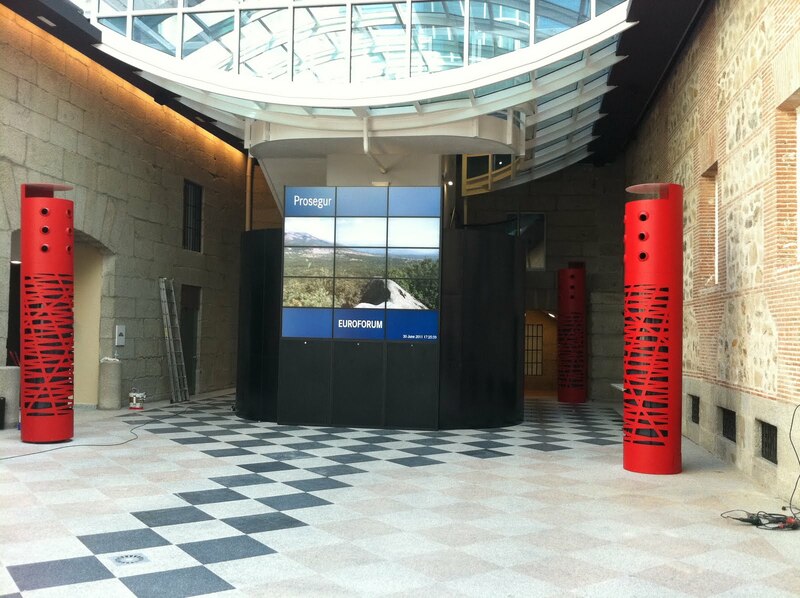 A 1 x 3 video wall in Weatherford’s foyer displays content from an ONELAN NTB 510S. The room booking is done through third party software which provides the output in an html file and is retrieved through the HTML zone on the ONELAN NTB. This video wall displays the sessions taking place in all the meeting rooms and class rooms in the facility. Screens in the Auditorium display are used to present the details of the session in progress, (driven by a NTB in the simulation room) run videos showing how Weatherford’s products are used e.g in oil fields. In the lobby 42” displays driven by ONELAN NTB 510S units show digital signage content for Weatherford WTTC including information on the organization and its mission statements. A 42” display is installed in the foyer in portrait mode to display greetings and welcome messages to visitors. 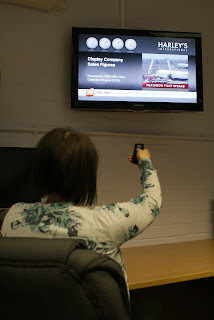 Weatherford’s digital signage content is managed centrally by a dedicated member of staff. The Ad hoc capability enables changes to be made e.g stock levels on a daily basis. Weatherford are very happy with their digital signage as it has improved internal communications, and is much more effective than their previous system which comprised PCs running Powerpoint. ONELAN will also be showing the Cyclone enterprise solution with multi-channel capability, auto playlists, Media and site metadata. Casino Lugano is situated on the lakeside, in the central area of ​​the city of Lugano itself. They wanted a solution that could manage multiple video sources on one screen, and chose digital signage to do this. 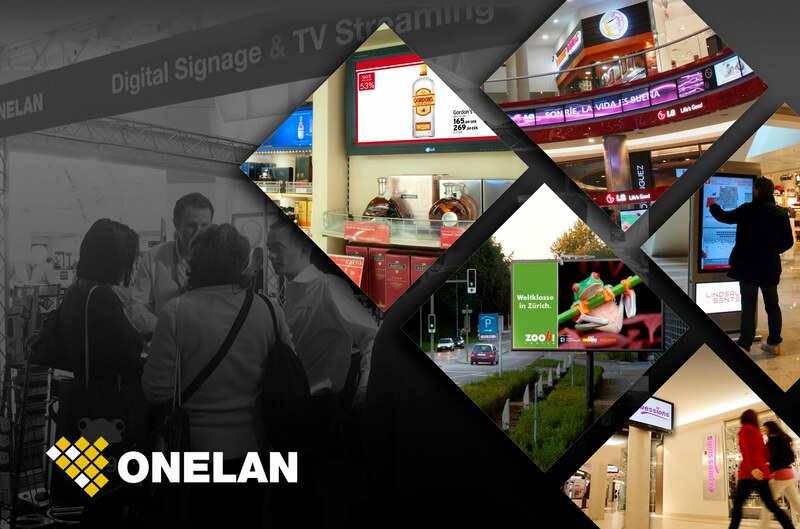 Having seen ONELAN at ISE 2011, they chose their digital signage for its user friendliness. Casino Lugano needed to manage 20 screens in real time with different content (publicity,promo,tv) remotely from an executive office. 22 ONELAN Net-top-boxes (NTB) are installed and one Omni-server. 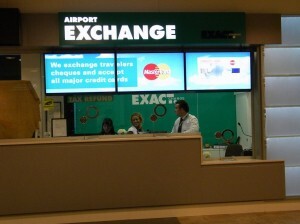 Spanish currency exchange company Maccorp Exact Change has a new digital window to attract its clients at the airport. The project includes a video wall network operating in Madrid Barajas Airport, supporting seven foreign exchange retail locations. The programming and management of the network has been developed by Realisation and it is managed from the company’s offices in London. The digital signage application uses ONELAN and the displays are ultra narrow bezel screens. The project was developed in just three months and incorporates intelligent programming to present 80 currency offers in 11 languages across five different video wall screen configurations. KWK Knurów is part of a group of mines owned by Kompania Weglowa in Poland. Kompania Weglowa comprises fifteen individual mines and is the biggest coal mining operation in the European Union. It is located in Silesia in the south of Poland. The mine employs 60,000 people, and produces 40,000 tonnes of coal annually. The mine management wanted a cost effective method of displaying important health and safety information to both miners and head office staff. 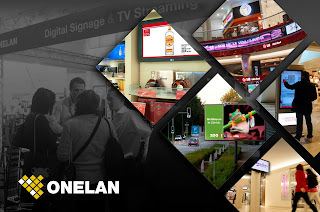 Kompania Weglowa selected ONELAN digital signage as it represented the most suitable solution for their requirements. They have ten ONELAN Net-top-box (NTB) 510 subscriber units and ten ONELAN NTB 510 publisher units that are used for Health and safety training and company presentations for coal mine workers. 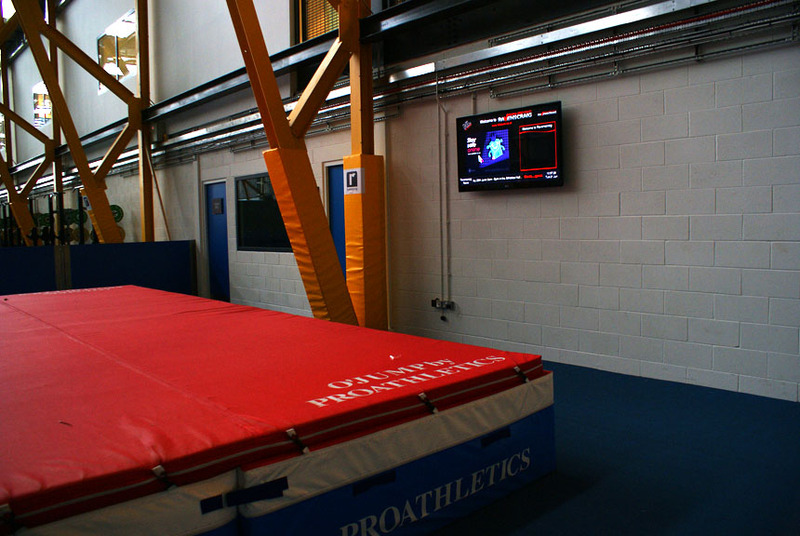 All screens are located in the main ​​staff training area; it is too dusty underground for the screens to operate. Content is managed by Department of Health and Safety and not by the mine itself. The ONELAN NTBs drive 46” and 50” screens. There are also two video walls (one is 3x3 and the other 2x3). San Lorenzo de El Escorial is a little village near Madrid. Felipe II chose it in XVI ages to build the Real Monasterio. 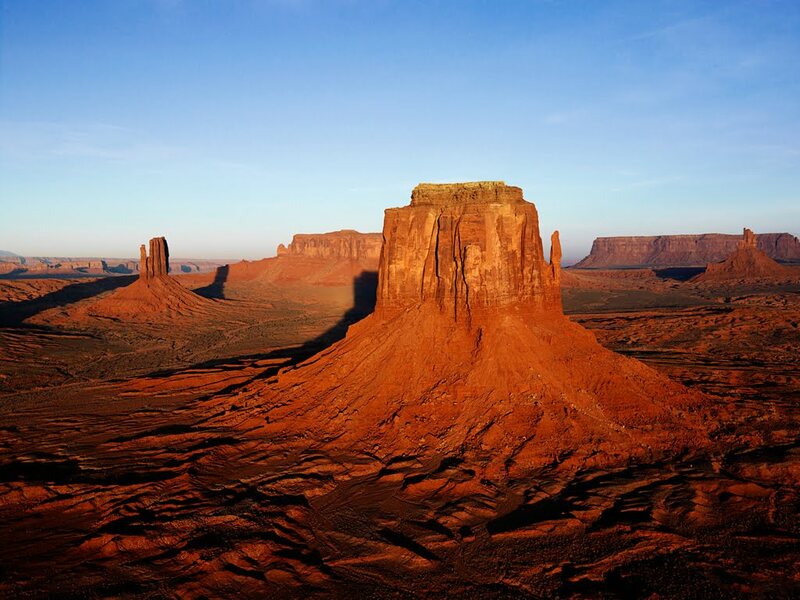 It is considered the 8th Wonder of the World and is a World Heritage site. This building is now the Euroforum headquarters dedicated to specialized training and important business meetings. The building was completely restored in 1991 for Miguel de Orion, to become the biggest centre for management development in Europe. audiovisual equipment and an ambitious digital signage installation. Firstly the updating of existing audio and projection equipment in different rooms and halls and secondly to create a dynamic comunication system in the main courtyard, reception and entrance hall, and conference rooms. Digital Signage was chosen as it allows the centralized management of the entire network, the ability to instantly update the content and information, and the ability to integrate with other systems. ONELAN was chosen for its stability, because it is Linux based and because it can be integrated e.g with a room booking system with Google Calendar or Outlook, or with TV channels and the ability to transmit live events with streaming. 22” flat screen monitors each driven by a ONELAN Net-top-box (NTB) are located outside each hall and show meeting information. In the main courtyard there are two large format videowalls both 5 x 3 40” LCD monitors with thin border. Each videowall is run by two ONELAN NTB 5505 player, and shows four simultaneous videos, flash animation, TV images and live events from the halls. The biggest challenge was to install digital signage system in the main courtyard whereby it is fully integrated between the stone walls of the building. 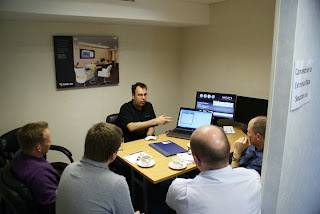 RPS Audiovisual worked with architects to get the best practical solution and aesthetics. A unique metal was designed to facilitate access and maintenance. The Thomastown Recreation and Aquatic Centre (TRAC) project in Melbourne, Victoria, Australia is a $40M redevelopment of an existing aquatic centre into a state-of-the-art aquatic and leisure facility at the centrepiece of the local City Of Whittlesea council. It features an indoor sports stadium, indoor heated water park, 50m swimming pool, outdoor water park and fully equipped health club, fitness studios and consulting suites. TRAC required an easy to use and powerful digital signage solution that would inform and entertain visitors to the centre. The solution had to be centrally managed and enable staff to instantly change the displays with a range of content such as Video, TV, web content, Powerpoint, Text and Flash. 5505 media player. The screens displays centre information, forthcoming events, welcome messages, Live Video and Powerpoint presentations. The TRAC reception is an open area fronted with large floor to ceiling windows, with doors leading directly to the main reception desk. At the desk there are 3 x 46” commercial displays side by side each displaying content from a ONELAN NTB 510. The screens display a mix of pricing, classes, events and local news. The hallway and gym areas experience heavy foot traffic making them excellent locations for two 40” Touch screens. These screens provide class information and schedules for visitors. A user is able select from a range of classes and watch a video of that class. The content is created and managed by the centre marketing team. 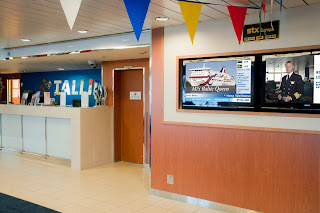 The staff at TRAC created all of the digital signage background layouts and touch content. 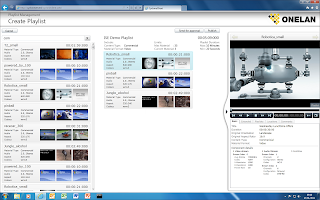 The Touch content required configuration of playlists and zones to trigger videos and display schedules. The solution was designed and managed by the marketing team at the centre. • TV Streaming - Streaming forms an increasingly important part of signage, from displaying full screen TV on a signage player for queuing customers, to streaming a complex multi-zone presentation to IP enabled TVs. ONELANs communication platform provides the tools to stream video around your facility and manage the recording, storing and redistribution of content, as your signage solution requires. • Data Capture Engine - ONELAN’s Data Capture Engine enables capture, collation and re-purposing of business data stored in Excel files, SQL databases, Microsoft Exchange servers and XML files to be accessed and displayed on Digital Signage. The DCE has recently been enhanced with several new exciting features including bulk reconfiguration allowing configuration changes to be made to all connections with a single button press, a new Text connector and improvements to tabular media design. ONELAN is delighted to have been shortlisted for a BETT award 2012 in the Digital Devices category with the Data Collection Engine (DCE). ONELAN’s DCE v 3 has recently been enhanced by several new exciting features including bulk reconfiguration allowing configuration changes to be made to all connections with a single button press, a new Text connector and improvements to tabular media design. This award category rewards the development of innovative and effective ICT hardware for learning and teaching in the primary, secondary and further education and skills sectors. In response to customer demand, ONELAN’s Data Collection Engine (DCE) v 3 now has several new exciting features. Firstly bulk reconfiguration allows configuration changes to be made to all connections with a single button press. This simplifies configuration for larger deployments in restaurants, retailers and schools, particularly when media players are added or removed. The Text connector has been enhanced to add additional filter settings, allowing a much finer level of control over the processing and results. This means that data can be updated much faster and more easily. In addition, tabular media has been improved to automatically detect a wider range of row and column heading combinations, providing a more accurate display e.g in a restaurant or cinema, without having to resort to custom media. ONELAN is delighted to have won the Digital Signage Manufacturer of the Year Award at the prestigious AV Awards 2011. ONELAN’s continuing success is underpinned by strong international sales growth with 50% of production exported in 2010 representing 116% growth from 2009. ONELAN has enjoyed the best ever turnover growth and increased profit since starting in the digital signage business around ten years ago. By introducing innovations in marketing, product design and sales, ONELAN is now reaping the rewards and growing market share across a wide range of sectors including Digital Out of Home (DOOH), Education, Retail, Health and Leisure. The company has grown considerably over the last year, increasing sales turnover by 32% even in these hard economic times. The growth has been in part to the new product development, which in turn benefits the industry, and in part to sales growth based on marketing activities to increase market share globally. September 2011…ONELAN will be supporting RPS Audiovisuales at the TOTALmedia show (Stand 37) on Wed 28 September, 2011 to Thurs 29 September, 2011 in Madrid, Spain. RPS Audiovisuales have also entered three TOTALmedia awards with ONELAN in the following categories: major digital signage installation, interactive kiosk and digital signage software. 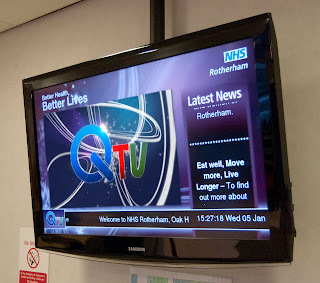 NHS Rotherham’s QTV service is a television network that distributes health information (signposting service information, health promotion campaigns etc) to television screens located within patient waiting areas throughout the Rotherham borough. It is designed, developed and managed by NHS Rotherham Creative Media Services (CMS). Starting from programme production through to networked distribution and broadcast, QTV is run very much as a public service TV station with its own unique channel brand. 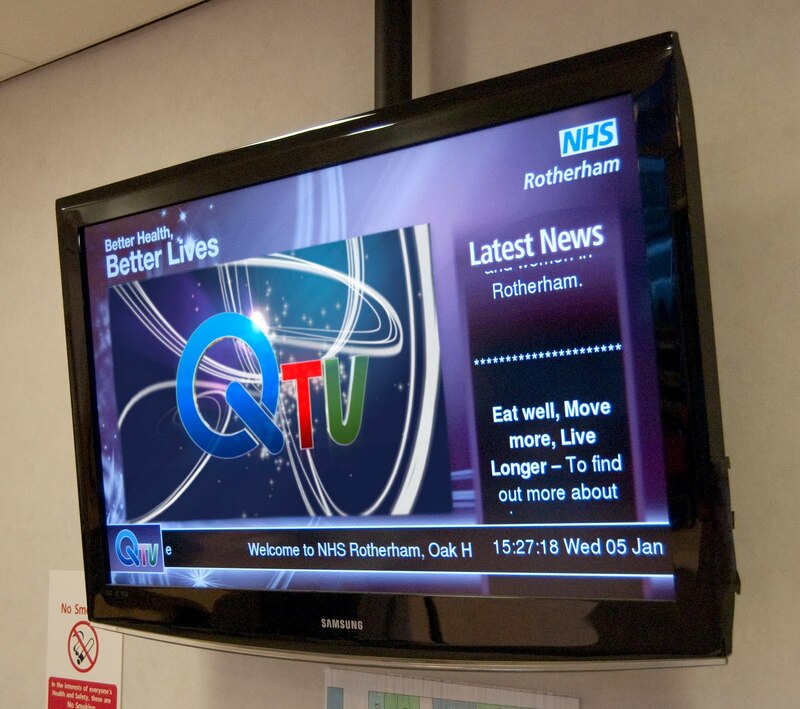 NHS Rotherham have been delivering content via QTV since 1997. It has evolved from VHS tapes, through to DVDs (delivered every two months), and finally the current ONELAN digital signage solution. The CMS production team researched alternative programme delivery systems before establishing the ONELAN system as an excellent solution to meet their needs. The CMS production team wanted a very exacting system to meet their requirements; they needed to work closely with their equipment suppliers 'Universal AV' and ONELAN to ensure that ONELAN Net Top Box (NTB) processor speeds and CAT5 network issues were resolved and the screen system was not compromised by the strain of continuous video processing. 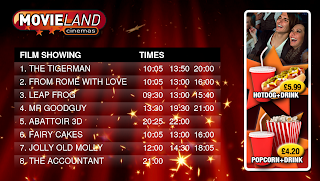 Programmes are scheduled into the daily play list located on one of the ONELAN Net-Top-Box (NTB) 5005’s. The production team keeps two NTB’s in the studio, one as a test bed for quality control/training purposes and the other as their main publisher box. Once encoded, content is published and uploaded to a dedicated FTP server. Finally overnight downloads are made across the local NHS IT network to avoid interruptions to critical clinical IT activities and maximise usage of NHS bandwidth. This results in a seamless public facing information service that can be updated and refreshed daily if required. The TV screens are subdivided into zones, which display continuous video programmes, local breaking news in the form of scrolling text, along with time and a tickertape for adhoc information specific to each screen location. Hourly updates of news and current affairs through the medium of BBC News24 are delivered through the freeview TV input available on receiving sites’ ONELAN NTB 5005s. "We had to raise our game with production values and content management, especially as our locally produced content is up for direct comparison with the production values of the BBC News24 programmes, which hit the screens at the top of each hour, and then run seamlessly into QTV programmes. NHS Rotherham take it as a great compliment that the public think local content is produced by some London based outfit, when asked in a recent service survey which informed an academic research project." A research project “Building Sustainable Health Capital in Rotherham” conducted in partnership with Manchester Business School, showed how very effective this form of information delivery system is in gaining real terms health capital. Compared to other forms of receiving health information it was rated by patients as only second to receiving trusted information directly from a doctor or other clinician. Monaghan Community Forum required a series of digital signage noticeboards which community groups could be trained to use for promoting local events in libraries. A wide range of users needed to easily access and update the boards with eye catching content both locally and remotely. 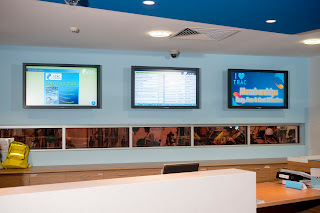 A ONELAN digital signage system was chosen by Monaghan Community Forum. ONELAN 510P and 620P Century Net Top Boxes (NTBs) were installed in five locations driving 42” LCD flat screens. Several NTBs are networked and controlled centrally, allowing library staff to collaborate on content. Dara MacGhabhainn, Monaghan Community Forum. Located along the famous Shanghai bund, the bund sightseeing tunnel connects the Puxi to the Oriental Pearl Radio and Television Tower in Pudong. 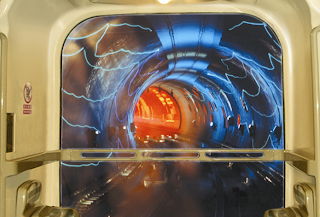 Modern technologies are applied to the interior walls of the tunnel, providing passengers with pictures, patterns and views to make them feel as if they were right at the scene. As part of the bund sightseeing tunnel’s tenth anniversary, a photography booth service was started. The bund management were looking for innovative ways to promote their latest offering. They chose digital signage as they decided that it would be an excellent tool to attract the attention of potential customers. A ONELAN 510 Net-Top-Box was installed to drive two 47” screens, both of which are located at the Puxi entrance of the sightseeing tunnel. 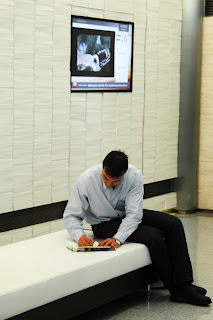 There are similar plans to do the same at the Pudong entrance. The bund management were impressed with the content developed by ONELAN China, which includes a layout enhanced by dynamic video and images. The easy drag and drop function using the FTP server allows digital photographs of potential customers to be displayed almost instantaneously on the TV screens. This enables customers to check their photographs thoroughly prior to purchase. 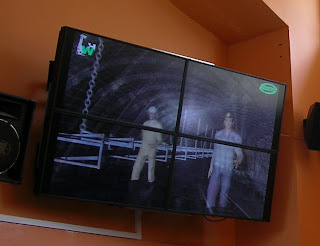 The combination of smooth audio and visual content has attracted considerable attention from tunnel visitos, prompting many to stop and take photographs at the booth. “ONELAN’s system has created endless marketing possibilities for the sightseeing tunnel … and has increased our visitor revenue.” Mrs Yang, Bund Sightseeing Tunnel’s Staff Supervisor. ONELAN have signed up a new distributor, Verrex Distribution Limited to increase their coverage in Hong Kong and the Asia Pacific region. Part of the Verrex family of companies, Verrex Distribution Limited is an authorized distributor of professional conferencing, collaboration and presentation technologies. The company connects its customers – pro-AV integrators, dealers and consultants throughout Hong Kong and other Asia Pacific regions – with quality-assured products, technical support and training. They are delighted to have added ONELAN to their portfolio. Café Bolle is situated in the city centre of Tilburg in the Netherlands. 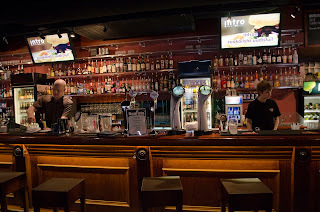 The café management aim to target as wide an audience as possible, offering a variety of theme nights and a film menu with an early dinner for when customers are planning on going to a movie afterwards. Café Bolle is the first café in Tilburg to adopt digital signage. 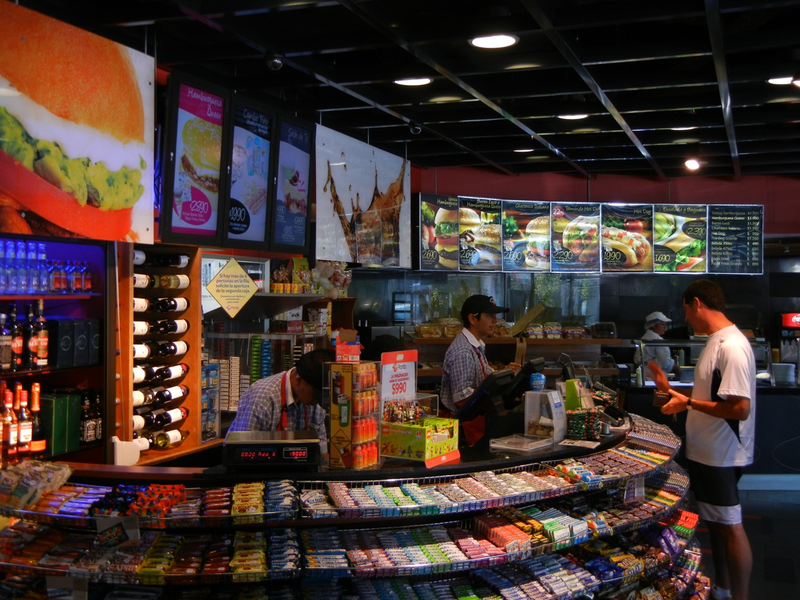 They wanted to attract customers and then promote special deals to them once they are in the café, and decided that digital signage was the best way to achieve this. ONELAN was selected due to its flexibility and ease of use. One ONELAN Net-Top-Box (NTB) 620 is installed driving three 42” screens. 80% of the content comprises the café menus and specials and 20% is used to show commercials. Café Bolle pay a monthly fee for the NTB and the content management by ADL Narrowcasting (ADL). ADL manage all the content and are responsible for updating the menus as well as sourcing the advertising. The advertising is scheduled to run at different times of day, depending on who is in the café at a particular time e.g mothers and children in the day time, students in the evening. Sandvik Mining and Construction (SMC) is a business area within the Sandvik Group and a leading global supplier of equipment, service and technical solutions for the excavation and sizing of rock and minerals in the mining and construction industries. SMC has operations in more than 130 countries and approximately 15,500 employees. With a vast amount of data that needs to be updated every hour, SMC Shanghai required a simple knowledge management solution able to disseminate information to staff quickly and easily. After being suitably impressed by the ONELAN system used in another SMC region; SMC Shanghai decided they wanted the same for themselves. They installed a ONELAN Net-Top-Box (NTB) 5505 publisher and subscriber, in addition to three other NTB 510 subscribers to power eight screens throughout the office. The publisher and subscriber units came furnished with TV tuner and were placed in the pantry, so that even while taking a break and watching television, staff could still remain abreast of business developments. Out of the three 510 subscribers, one was used at the reception to display the corporate video and to welcome guests. The other two subscriber units were placed around the office to notify staff about SMC’s latest business data. ONELAN’s products excelled in meeting all of SMC Shanghai’s needs, as they were able to provide different types of content to both employees and visitors. 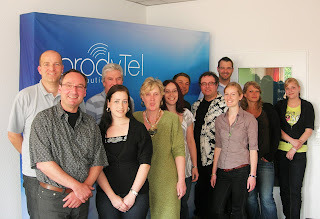 July 2011….New features in ONELAN’s v8.1.1 Net-Top-Box (NTB) software have been developed in response to demand from resellers. Increasingly ONELAN reseller digital signage installations are becoming larger and more complex, creating a need for a remote setup capability. The new bulk reconfiguration capability allows Net-Top-Boxes (NTB)s to have setup copied and updated by the network management tool, the DSM V3.0. This simplifies rollouts for large deployments. 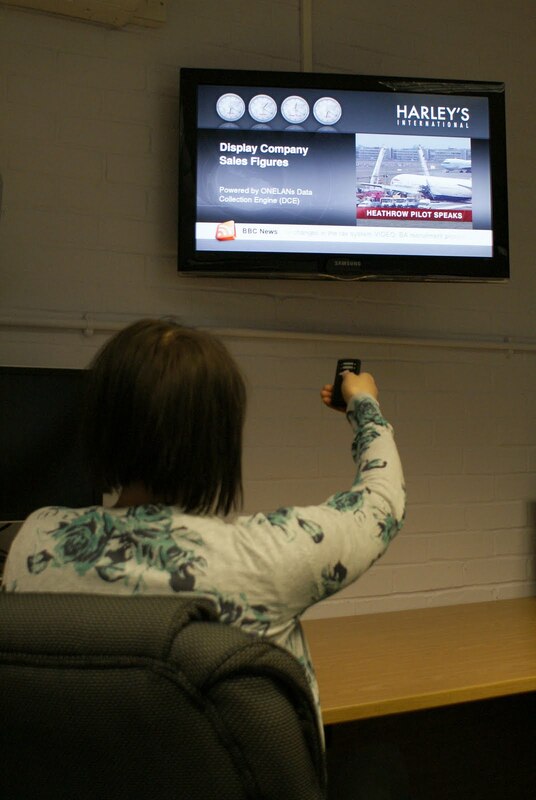 To simplify end user operations with TV and streaming content a Remote Control has been launched. The Remote Control allows volume to be altered and Ad hoc TV or Radio stations to be changed with no programming. In addition, there are four programmable buttons that can launch any specific piece of content e.g welcome videos, on demand. There is also a new Ad hoc media picker that allows only chosen TV or Radio stations to be picked by an Ad hoc user. In this way unsuitable channels can be avoided. All Net-top-boxes shipped with TV cards will now include remotes as standard. The new Wi-Fi Wireless network capability supports 802.11a, b, g, n at 2.4GHz and 5GHz bands on the NTB. This provides a cost effective solution to overcome the physical limitations of a wired network, e.g in a listed building where it is impossible to drill through walls to lay cables. Wi-Fi is ubiquitous and most organisations have wireless networks set up. This provides easier network integration than with traditional wired networks, while still providing easy access to setup and configuration through your desktop web browser. The user interface is now also supported in Thai and Portuguese. Finally the XML API 2 has been improved and extended. This makes it simpler to integrate ONELAN’s digital signage with other third party systems. Ravenscraig Regional Sports Centre wanted to develop a communication system to keep customers updated with activities and sports centre facilities. They wanted to be able to promote forthcoming events, and also entertain customers while they are at the facility. 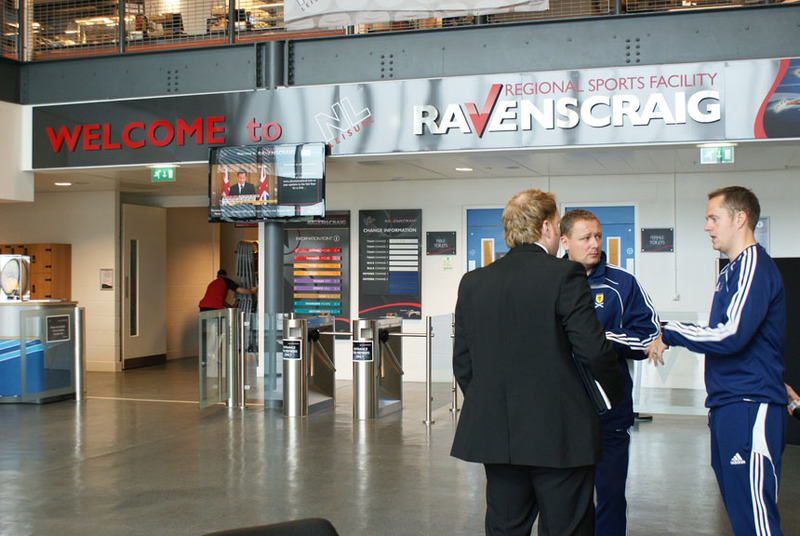 Ravenscraig chose ONELAN digital signage and have installed one Century Net top box (NTB) 610 Publisher units, five Century Net top box (NTB) 510 Subscriber units, two Omni-servers and a TVG Gateway. The digital signage drives four 60” screens and three 50” screens. These are located across the site, with one in reception, one in the athletics hall, two in the gym and two in the café. Live TV and Sky are shown on screens on the Technogym equipment and in future these will also be able to show the digital signage content shown elsewhere on the site. There is also a drop down projection screen that will be used to show live sporting events such as boxing and snooker matches. The Omni-servers enable different content to be streamed to different areas of the site. Ravenscraig have integrated the ONELAN digital signage with the local council’s IT infrastructure, but the bandwidth has to be reduced from 100 mbps to 10mbps to stream TV via LAN to the Technogym machines. In addition to the live terrestrial TV and Sky that is currently streamed in, Ravenscraig also plan to use live radio feeds. ONELAN digital signage is also being installed at four other NLL sports centres as well as a golf club. Ravenscraig are aware that their digital signage system is only as good as the content. Two people locally in marketing and a business manager centrally ensure that content is changed regularly. Currently the advertising shown is all internal for promoting e.g forthcoming events. It is much quicker and cheaper for Ravenscraig to design digital signage content for an event, and then if necessary use this for supporting leaflets too, rather than have to rely solely on printed collateral. In future third party advertising will be shown on the digital signage. The senior management of NLL are very happy with the ONELAN installed at Ravenscraig, especially as it represents good value for money. North Lanarkshire Leisure (NLL) is a Scottish Charity that works in partnership with the North Lanarkshire Council and other strategic partners to deliver and improve sport, leisure and health opportunities throughout the authority. North Lanarkshire Council, Sport Scotland and Ravenscraig Ltd provided the funding for the Ravenscraig Regional Sports Facility which will host local, regional and national sports, as well as leisure and cultural events. It is also capable of accommodating up to 5,000 people attending concerts, exhibitions or sports events. ONELAN’s DCE is a very cost effective solution that can be deployed as part of a new installation, or incorporated into existing installations. The Integration Services department handles all aspects of integration of ONELAN products with third party systems and products. Aramark have installed ONELAN digital signage at Codelco, Chile’s largest mining company. Aramark have a contract with Codelco to manage and operate their canteens. The contract requires them to supply accurate menus; if these are incorrect they are fined. Real samples of each dish on the menu had to be displayed in each cafeteria, but because of the conditions in the mine cafeterias, these did not last very well, and by the end of each day did not look very appetizing. Aramark wanted an automated, hygienic way to show menus in the 30 different cafeterias located throughout Codelco’s mines. The solution needed to show the correct menu choices, including menu of the day and healthy eating campaign information with calorific value and colour coding for each dish: green for organic choices, yellow for meat, red for less healthy options. Aramark selected digital signage, and ONELAN specifically, due to its Ad-hoc capability, the ability to combine a sound track with moving text and ability to connect to different RSS feeds. In addition the ONELAN Century Net Top Box (NTB) 510 can be installed behind the screen. Grupo Clan, ONELAN’S distributor in Chile supplied the digital signage and managed the installation. 60 ONELAN NTB 510s are networked & monitored remotely via a ONELAN Digital Signage Manager (DSM) using the customers’ network. One NTB 620 publisher is installed in Grupo Clan’s headquarters in addition to a ONELAN DSM SC1000, and an FTP server. The screens used throughout the cafeterias are 40” LCDs. Grupo Clan manage the system via the DSM. They schedule the menu for the month including replacement menu options in advance, while the cafeteria staff use the Ad-hoc capability to instantly change dishes that run out during the day. 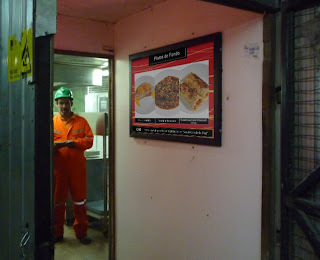 Aramark are very happy with their ONELAN digital signage, as they are able to give a better cafeteria service to Codelco and at the same time make the mine canteens look much more up to date. 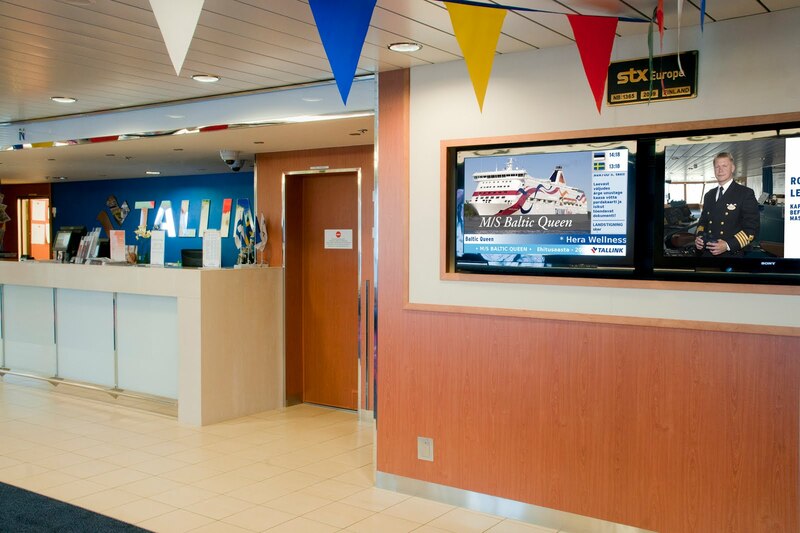 ONELAN is pleased to announce that their reseller in Estonia, SiseTV, has won a bronze award at the DS Apex Awards for their digital signage installation with Tallink Silja Ferries. Microelectric Hearing Aids Ltd have a group of five hearing clinics in Switzerland. They wanted to make their clinics appear more prestigious, and at the same time have a means of communicating information to their patients as they waited. While their staff are good doctors in their field of hearing, they lacked the ability to promote their services and particular products to the captive audience of waiting patients. With waiting times of 5-10 minutes, the clinic wanted to entertain patients, and make them aware of additional and special products. Microelectric established that digital signage was the best solution for their needs, and selected ONELAN as the most suitable system. Five ONELAN Net-Top-Box Century 510s have been installed driving 40” LED screens, one in the waiting room of each clinic. Promotional videos are supplied on a regular basis by manufacturers of hearing aids and accessories, and Microelectric choose which ones to use. These are then rendered and uploaded to the media players. All the content is updated remotely via internet (using FTP and HTTP) by Sinform GmbH, who both supplied and now manage the digital signage for Microelectric. Microelectric are very happy with their digital signage, and have noticed an uplift in sales of promoted services and products e.g hearing aid batteries and cleaning products. 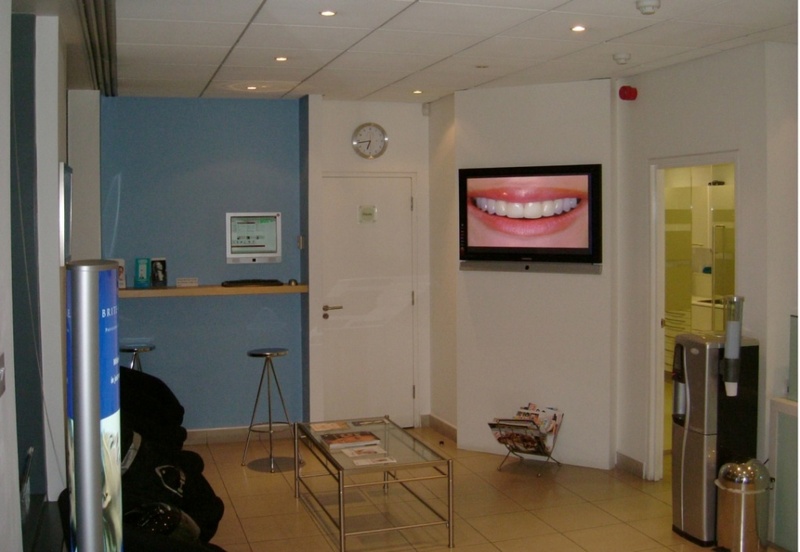 Magpies Dental Practice is a modern busy UK National Health Service and private practice, offering a range of treatments and holistic facilities to its patients. The practice was looking for a way to communicate other services and treatments available which patients were not always aware of e.g cosmetic dentistry offerings. 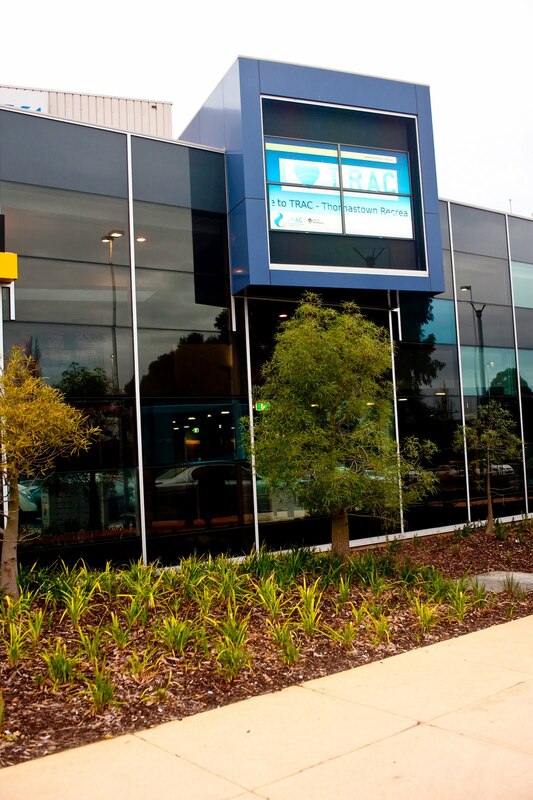 Magpies realise that informative advice to a captive audience benefits patients, and by using digital signage from ONELAN to do this differentiates them from other practices. The dental practice staff can log in via an Internet browser and navigate to change a layout, add content or send a message. This is customisable and flexible, and suits the way they work. They are able to communicate new treatments and facilities while showing up-to-date news, weather and TV. 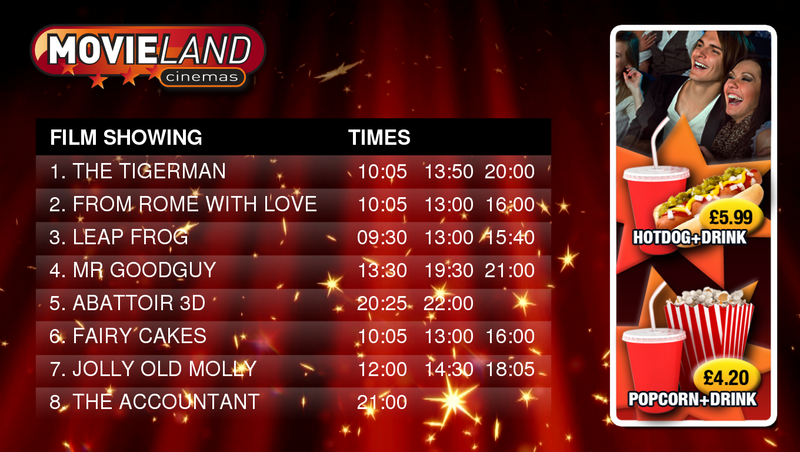 Layouts are scheduled to times to suit the audience. For example CBeebies is shown between 3:30pm – 4:30pm when most of the patients are school children, reverting back to BBC News 24. Magpies Dental Practice also find the ability to add PowerPoint™ files to a playlist particularly useful. Two screens show the same content in two separate waiting rooms representing an ideal opportunity for education and informative news to be absorbed by the visiting patient. The Media player is connected to their current network and uses a reserved IP address. Administration of the ONELAN system can therefore be accessed from any network PC. Access to the ONELAN media a player is via the reception PC. A series of shortcuts enable a quick message to be sent to the screen as well as uploading multiple content using the FTP shortcut folder. Because the ONELAN system is accessed via any Internet Browser, these shortcuts are also replicated on the office PC in the surgery basement. Content runs on a loop but looks fresh as the layouts changes regularly. A TV channel shown in a zone always makes the screen look current. 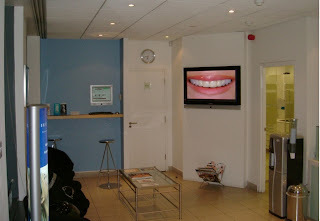 Patients can be seen looking at the screen while waiting to see the dentist. The result is a soothing distraction before their appointment. Cost benefits are not measured purely from the up-sale of content on the display screen, however increases in revenue and questions being asked relating to the content seen on the screen have been seen compared to leaflets and more traditional methods of information dissemination. At Euroshop 2011 at the Messe Düsseldorf, 26th February – 3rd March 2011 stand 5K26, ONELAN will be exhibiting Digital Signage and the latest software updates, in addition to showing an early preview of their new Enterprise Communications Platform. ONELAN’s new Enterprise Platform will feature Content Management, Managed Workflow, Transcoding and highly targeted content for very large networks. The new platform is designed for productivity and revenue generation at the largest scale and enables brand and advertising networks to generate more revenue whilst reducing management overhead. Content is scheduled automatically and transformed, scaled, converted or transcoded into the most suitable format for the target display. Rich Metadata ensure content is automatically scheduled once across multiple SD, HD, LED and Web displays. The content will then arrive in the right format, cropped, rotated and converted for its target, without any user involvement.